*Dress is FULL uniform including your band t-shirt underneath. Please do not wear any visible jewelry. Long hair is to be pulled back. Take good care of your uniform while on the road. Uniform care should be taken very seriously. All uniform policies are outlined in the band handbook. *The band room is not open after school since our departure time is relatively late. Go home. Rest. Eat. Be back no later than 5:30. Carpool if necessary. *Tonight's music is Part 1, 2, and 3. 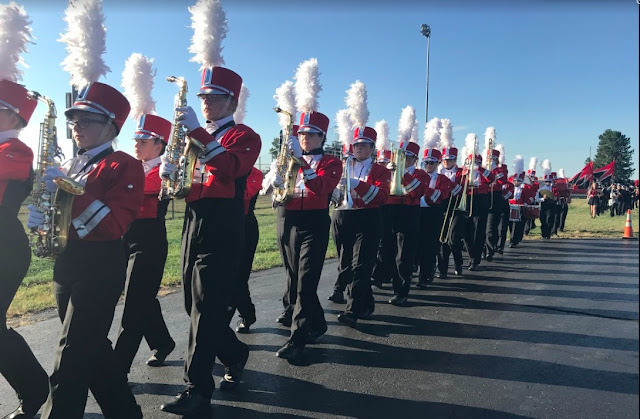 We will march and play the entire show for halftime. Cheers are also to be memorized. Stand tunes will be provided for the 4th quarter and do not need to be memorized. *If you are riding home from the game with a parent, you need to give a note to Mr. Keller or Mrs. Cooper before we depart FHS. If you are not riding the bus home, you MUST be traveling with a PARENT. *Pay attention to the game and be ready to play at any time. Non-band friends may be asked to leave the band area if they are a distraction. *Please encourage family and friends to attend away games. Also encourage them to come to the home side for our halftime performance. *You will have the third quarter off. Please be ready to play at the buzzer at the end of the third quarter. Bring spending money if you want to eat concession stand food during your time off. Let's have a great first road trip!